Back to Wyoming in the morning. I used the same reference photo for this painting as I did for my last pastel. I didn’t mess the seasons this time but it looks like spring rather than summer to me. That’s because it’s been such a wet year. I don’t think I’ve ever seen Wyoming so green. The early morning sun on the grass was simply spectacular. The problem for me was not to lose the forest in the trees. It’s much too easy to get mesmerized by detail and try to paint every tree. 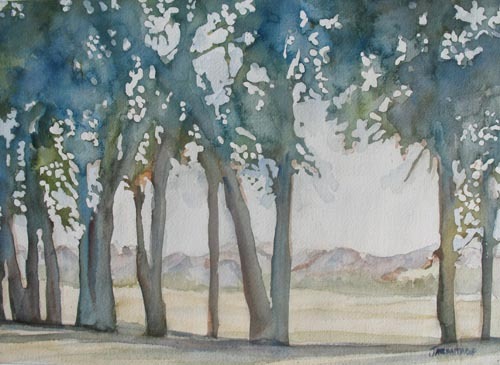 Yet the painting must still suggest individual trees and I wanted the emphasis to remain on the sunlit grass. My solution this time was to eliminate detail by using a big brush. The entire painting is done with a number 14 round brush (about three eights of an inch at the shank but coming to a fairly tight point). * Usually I work in numbers 12, 10, 8 and finish with 6 (the smaller the number the smaller the brush). I did not use mask either. Painting carefully around the lights rather than reserving them with mask forced me to keep them big. I also used a fairly limited palette: winsor purple, phthalo blue, cobalt blue, quinacridone gold, and burnt sienna. This not only helped unify the painting, but helped me concentrate on big shapes. But I have my husband to thank for the key to this painting. He came upstairs and looked at it in progress. Stephen is not good at seeing what to do to a painting, but he’s very good at seeing problems. It pays to listen to him. I thought about it. One classic maneuver is to put a lot of detail into the foreground. I used that approach with my pastel. But my painting was already too abstract to allow much real detail in the foreground. In the end I did two things. I added texture to the foreground and sharpened up the trees just where they intruded on the distant grass at the center of interest. Together the changes created instant depth. *Actually, I used one other brush, but only for my signature. For that I used a number 2 rigger. Riggers are very long thin brushes designed to make long thin continuous lines without having to repeatedly re-dip then in paint. The name comes from their usefulness in painting sail rigging. This painting is currently for sale on line at my Etsy shop. Or purchase a print. 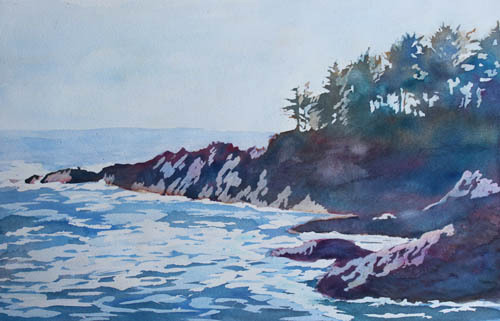 Here is another vacation watercolor. This one is from Yellowstone National Park on the north side of the lake. We picnicked here on our last day in the park. Like my previous painting of Fort Robinson, I simplified the image by masking heavily and then getting out the big brushes. I began by painting in the sky and the light blue of the lake. Then I masked the sky and all of the water except the dark ripples. I painted the trees and hills in used a one inch brush and moving diagonally in wet juicy strips of cobalt blue, raw sienna, and phthalo blue. I blotted the rocky edge in with burnt sienna. 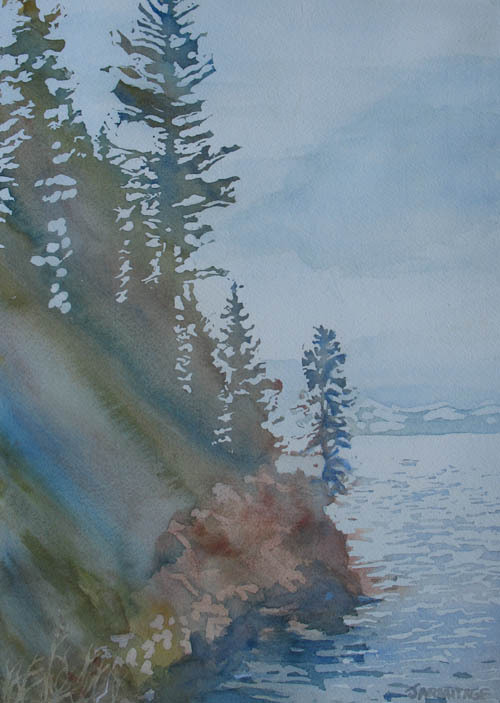 The lake ripples are cobalt and phthalo blue grayed down with burnt sienna. After the paint dried I picked out the grass and the highlights on the rocks with mask and added more paint to the rocks and foreground. I’m just back from an extended vacation that took me across eastern Oregon, Idaho, Wyoming, The Black Hills of South Dakota, Montana, and the northwest corner of Nebraska. 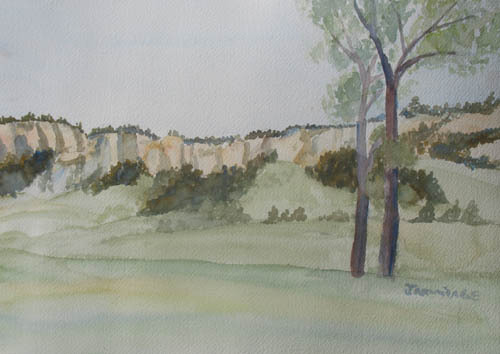 These paintings come from that northwest corner of Nebraska, at Fort Robinson State Park, where my Mother’s family held its family reunion this June. The cavalry fort was once known as the country-club of the army because of the polo field, golf course, swimming pool, gymnasium and horse trails in and around the camp. The swimming pool and the horse trails remain for the use of park visitors. 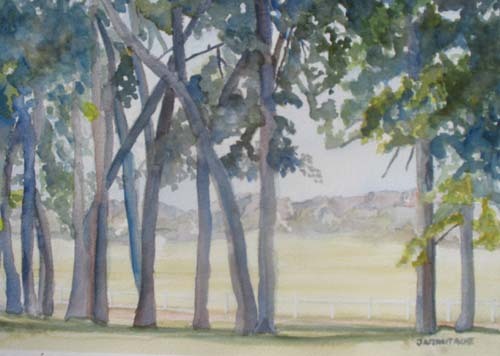 My paintings depict what was once the polo field and is now pasture for both horses and long-horns. We hiked into the bluffs and I may do some more detailed painting of them this summer. 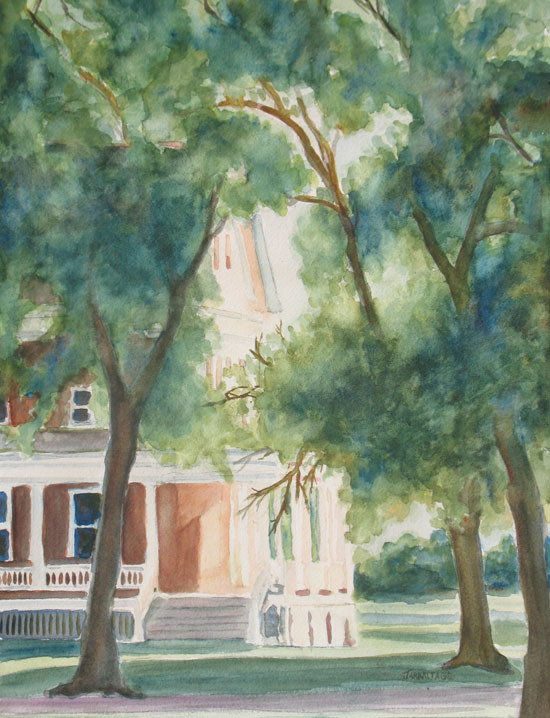 I made my first sketch of the field from the shade of our house (0nce the officers’ club and lodging for 65). I made a short job of it as the wind wanted to carry not only the paper, but also my palette, brushes, and everything else away. My main objective to was to capture the hills as reference for later paintings. I removed a number of trees from my line of vision. I wasn’t entirely happy with it although various people visiting the gallery while I painted it liked it. I have trouble with trees. Either I put in too much detail, or I put in so little they become bland. The painting also suffers from lack of punch. There isn’t enough value contrast and the fence interrupts the view without adding to it. It is unclear whether the trees or the view are the subject. For my second attempt I let go of realism and tried to paint the feeling of the cool trees with the dry view beyond. To do this I placed most of the attention on the trees. I began by masking everything expect the tree shapes. Then I got out the large brushes and began adding wet juicy areas of raw sienna and new gamge to the tree tops. I brushed the trunks with burnt sienna. Then I washed over the damp yellows with cobalt blue, phthalo blue, and French blue (much like cobalt only darker and not as transparent). I took the blue down the trunks too. I allowed back washes and other water marks to form. 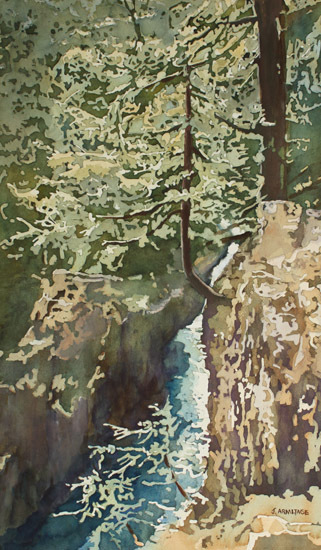 The resulting trees are less real, but much more interesting, and though they have a flat feeling to them, they convey the sense of light passing between the leaves and branches. After removing the mask, I added a light cobalt blue sky. I added some darker patches of blue around the edges of the leaves too. Then I used the same palette to add the bluffs and grass working carefully to keep the distant hills blue, pale and receded. FInally, I added a few small touches of orange mixed from burnt and raw sienna to the edges of the trees to bring out the green of the leaves. I will do the bluffs again later, closer and in more detail. They were beautiful to hike in. I may do the Fort itself eventually too. It is steeped in history beginning in 1873 when Camp Robinson was established to to protect the Red Cloud Agency. The agency was then home to some 13,00 Lakota Sioux most of whom were unhappy with the accommodations and the treaty which led to them. Crazy Horse died during a rebellion there. About ten years later, the 9th Calvary, an all black unit known as the Buffalo Soldiers were stationed there. Eventually the Fort became a remount station in WWII, a prisoner of war camp, and a K-9 training camp. Pieces of all these permutations remain on the site. This Through the Windbreak is currently for sale on line at my Etsy shop. The sketch is currently at Art in the Valley, Corvallis, Oregon. Or purchase prints from my Fine Art America Website. I have admired pastels and mixed media with pastels for some time now. There is a sparkly quality about pastels that no other medium can match. 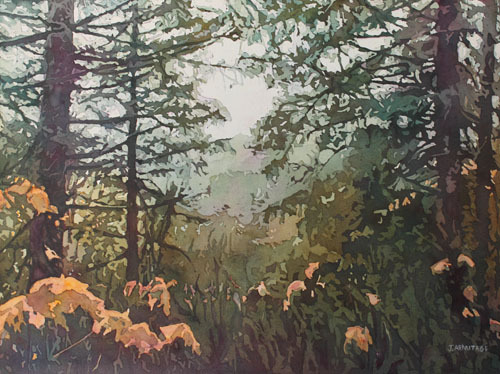 Pastels over watercolors can create both spectacular and subtle effects. My husband bought me pastels for Christmas, and I have been playing with them this last week. Pastels are if anything less forgiving than watercolor. All color mixing must be done on the paper either optically or by smearing. Pastel smears easily. The paper holds only so much pastel before it suddenly won’t take anymore. This last can be fixed somewhat, by using a workable fixative. Some lifting is possible with a kneadable eraser. The method is very different from watercolor too. Working with them is a kind of cross between drawing and painting. Pastels are an opaque medium and therefore work best if the dark tones are blocked in first and the lights laid over them. Highlight go on last. Nothing runs. The chalk stays right where you put it until you smudge it. I started this image on the rough side of a rose colored sheet of Canson Mi-Tietens paper. I laid in the sky with PanPastels. PanPastels come in pots rather than sticks and they are highly pigmented and almost dustless. Applying them is reminiscent of applying dry eyeshadow or rouge. The top of the sky is phthalo blue. Further down I switched to ultramarine blue. Then I worked back up the sky from the horizon, overlaying the deep blue with ultramarine and phthalo tints (both of which are almost white). I used white, and more of the blue tints to lay in the clouds. Then I got out a violet soft pastel stick and added the deeper shadows smudging them in as I went. I roughed in the far tree line with a dark blue shade of soft pastel. I added a dark green shade lower down and smudged. I pushed the pastel up into the sky with a sponge applicator. 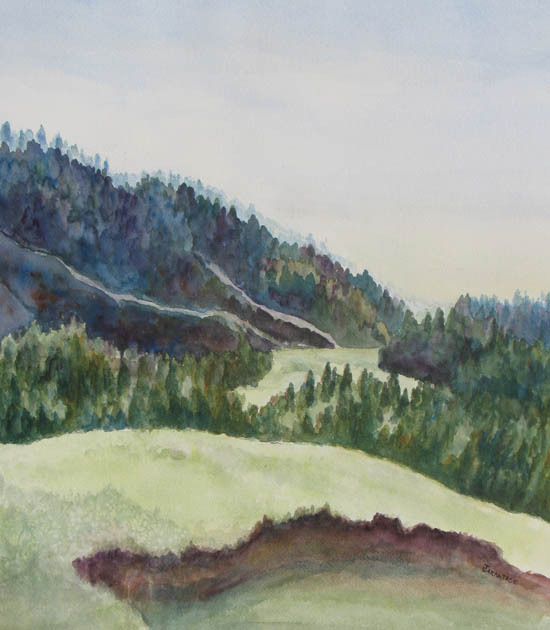 Returning to PanPastels, I added the hills with turquoise blue shade and bright yellow green shade. Burnt sienna came next. Then I went back over the hills with a variety of green and brown soft pastels to create texture. I smudged these in with my fingers. Continuing with soft pastels, I drew in the poplar trunks first with a dark green gray and a red brown. I added a lighter gray and then an almost white gray. Then I added the leaves beginning with a dull orange, continuing with a brighter orange and finally a yellow orange. I smudged the leaves on the farther tree to suggest a little distance. With soft pastels I put in blue and purple shadows under the foreground trees to indicate the rough grass line. I drew in the grass over the shadows with a variety of hard pastels starting with the darker colors and continuing with the lighter ones. I softened the lines with a finger. After years of reserving or painting around the lighter colors, laying in the trees over the sky and grass felt like magic. I enjoyed this. Watercolor will remain my primary medium, but pastel has a rough sparkly quality I’d like. Some images just seem to demand it. I may also do some mixed media, painting a watercolor first before accenting it with pastel. I ship my watercolors rolled in a tube or, if they or very small flat. 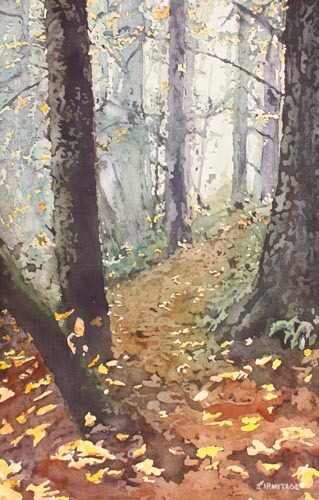 I provide free shipping for watercolors within the continental United States. Pastels cannot be safely rolled since they would smudge and they should be both matted and covered with a protective sheet. Therefore, the shipping cost of my pastels will vary depending upon size. All pastels will will include an acid free neutral colored mat and backing. I’ve been experimenting with a couple of new methods. These two paintings are the result. 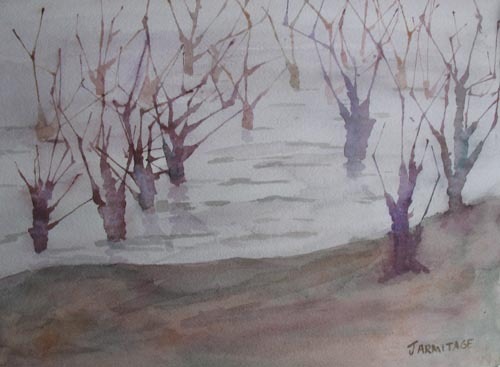 Both are based on some photos of trees half drowned by the swollen Willamette River I took this weekend. I wanted to catch the cold grayness of of the scene and the mystery of the half hidden trees. I blew the trees. I placed puddles of paint on the paper and blew them into trees with a straw. The line of paint running out from the puddle looks surprisingly like a tree limb. And the direction the paint goes in is quite controllable. But once the paint has started in one direction it’s hard to make it turn. The paint follows the wet path as if it were a stream bed. The solution is to drag a little paint in the direction you want to take it and thus start a new path. Where the trees over-lap it’s important to let the first tree dry completely before starting the next, otherwise the paint form the new tree will run up the first tree. There are several ways to vary the color in the tree. Leaving the supply puddle partially unmixed is one. New colors can be blown into the wet tree from the base. Accents and be directly painted onto the dry trees. I used all three methods on these paintings. The second method is painting grass and bracken with multiple layers of mask. Thin lines of mask establish the highlights. Then color is applied. Then more lines are applied. Then more mask for multiple layers. When the mask is removed a complex texture is revealed. I was less successful with this method. It’s hard to see what you are doing or to guess the result. More practice is needed. I used layered mask in Submerged I. But I didn’t like the results immediately. 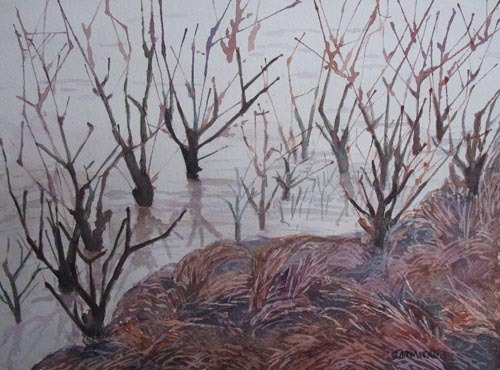 The foreground was too busy and detracted from my trees, which then looked much like the trees in Submerged II. After some thought, I painted over the trees in dark tones to match the foreground. The result is an evening picture. For the second painting I added the foreground wet into wet. The result is simpler and gives the feeling of the gray afternoon on the river. The palette for both paintings is: burnt sienna, phtholo blue and dioxion purple, plus a dab of hansa yellow. Or purchase prints from Fine Art America.com. Last week’s art show was on OSU campus in Corvallis. Early Friday morning it was dry and clear and the morning light was stunning, but I had no time to do anything but rush inside the Memorial Building to finish setting up. Sunday was dry, clear and cold too, so I went early and wandered the campus taking photos on the sunlit buildings. Not only was the light dramatic, but since all the leaves have fallen much more of the buildings were visible than last time I was on campus. The reflected trees in the arch above the main entrance to the Womens Building caught my eye. Closer up I noticed the sun on the craftsmen lantern. The palate is mostly cobalt blue, dioxin purple and burnt sienna. The extreme highlights are raw sienna and the deepest shadows contain phthalo blue. 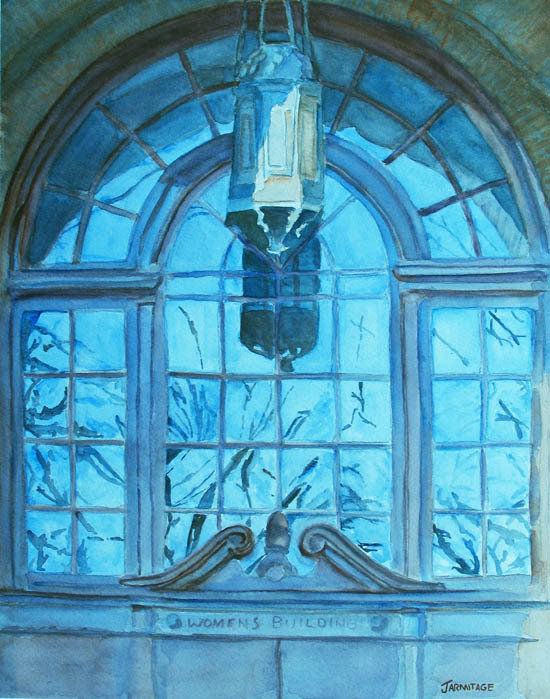 I began by painting in the windows in cobalt. 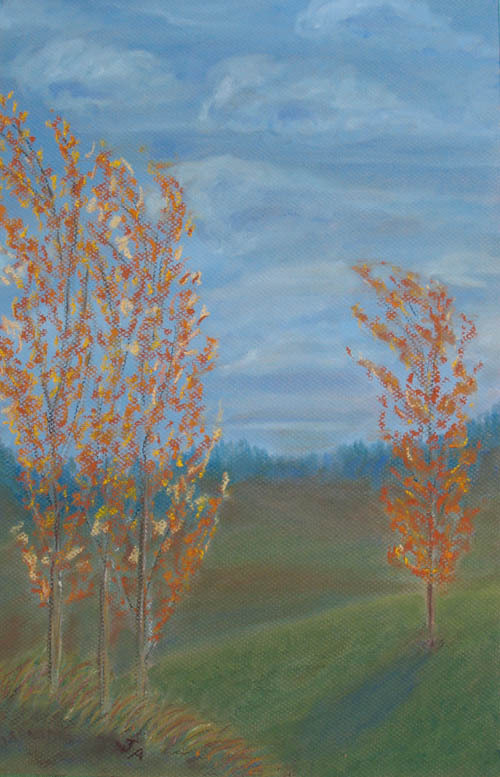 I added the reflected trees with a mixture on cobalt and burnt sienna. The metal mullions are layers of cobalt, violet, and burnt sienna built up one over another. I painted the lantern and its reflection next to establish the darkest values. I saved the raw sienna for the sunlit portion of the lamp and echoed it it the sunlit side of the arch. I showed to my painting friend when I had finished. She introduced me to a new word, “tenebrism.” It means the use of extreme contrasts of light and dark with small amounts of light shining out of vast darkness. I love extreme contrast, and I’m happy to have a word to describe it. I’m not sure that this painting as a whole is an tenebristic, but the lantern and its shadow certainly are, and they make the painting. Prints available at Fine Art America.com.